The desert has always held fascination. 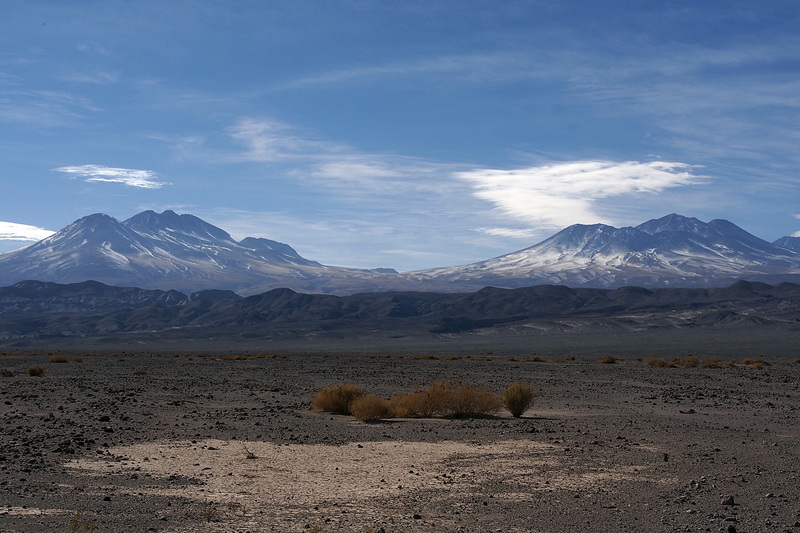 We have traveled across a few deserts: in the sub-arctic of Canada, California, the Middle East and Morocco, to name a few, but nothing like the Atacama in northern Chile. 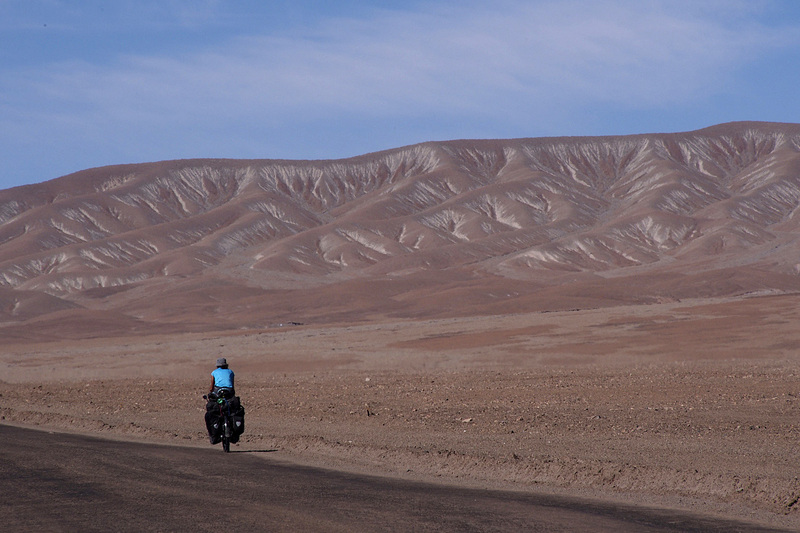 From Antofagasta, we began a steep climb for about 10 km onto a kind of plateau that slowly keeps climbing as it stretches east to the border with Argentina and Bolivia. 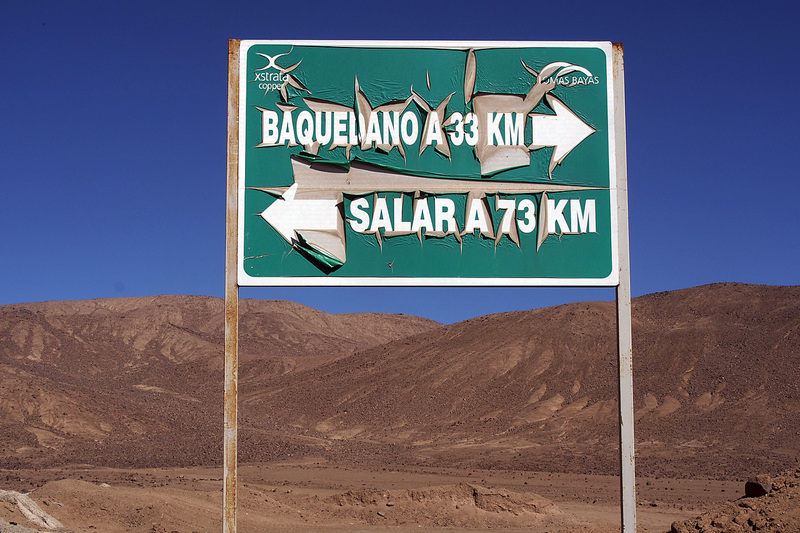 The west wind pushed us east quickly to Baquedano, a small town surrounded by copper mines. 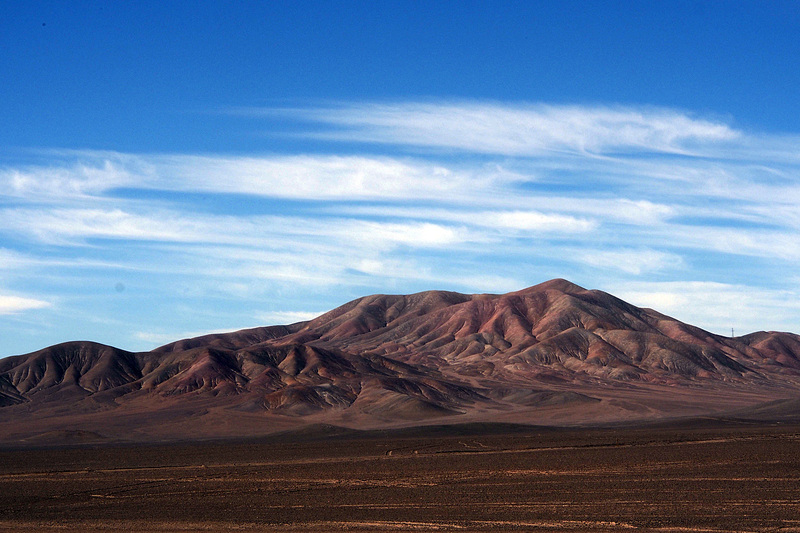 Copper is king in this part of Chile and responsible for a large part of this country’s GDP. Water wherever it can be stashed. We passed the Tropic of Capricorn in the middle of the afternoon and took a self portrait with the bikes to mark the occasion. 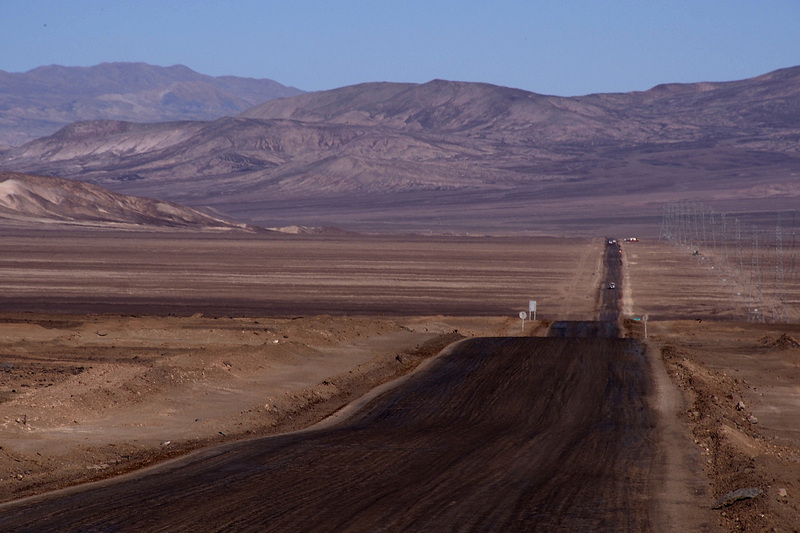 The challenge for this route through the Atacama is having enough water. 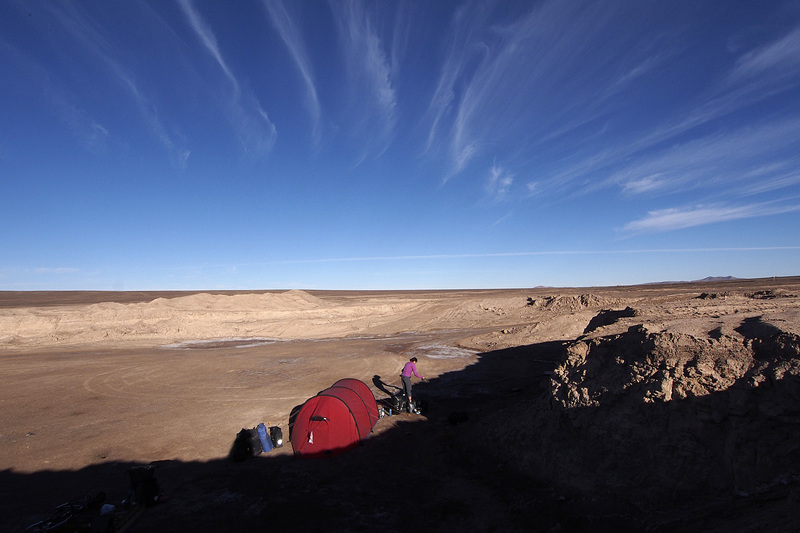 Baquedano, 80 km from Antofagasta, was a natural place for us to spend the night. After checking around town with several people we finally found a hospedaje. It was basic but it had hot water. The room had four bunk beds in it but no one else was staying there so we had the place to ourselves. It had been a long hot ride so after settling in, we went to one of the local markets to buy some beer and a salty snack (chips: salt and calories). The young man and woman in the store greeted us and he was interested in who we were and where we came from. He spoke some English and in our Spanglish we told him about our trip. He was impressed and waved us over to the other counter behind which all the booze was displayed and reached for a 1.5 litre bottle of wine and gave it to us. “It’s a gift,” he said. Despite our protestations, he insisted, so we had no choice but to accept. There was no way we were going to drink this much, so we put it in another container that we could carry with us the next day. Cooking dinner and having a beer in our Baquedano room. We cooked dinner in our room, drinking beer and eating chips while watching a movie on HBO. It seems no matter how basic the accommodation, there is almost always satellite TV providing a few English channels with Spanish sub-titles. It’s a nice treat to watch a movie once in a while. 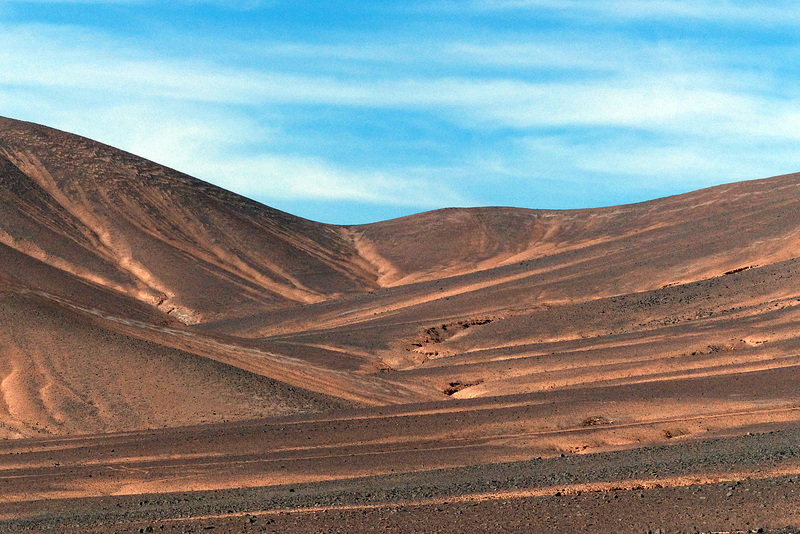 It is a little dry in the Atacama. In the morning we consulted our map to see what lay ahead and calculated how much water we would need for the next two days until we would reach the next town. We decided to take 16 litres to drink that day and the next, and have enough to make dinner and breakfast. This significantly added to the weight of our already heavy bikes. The road stretching east to Cordillera Domeyko. 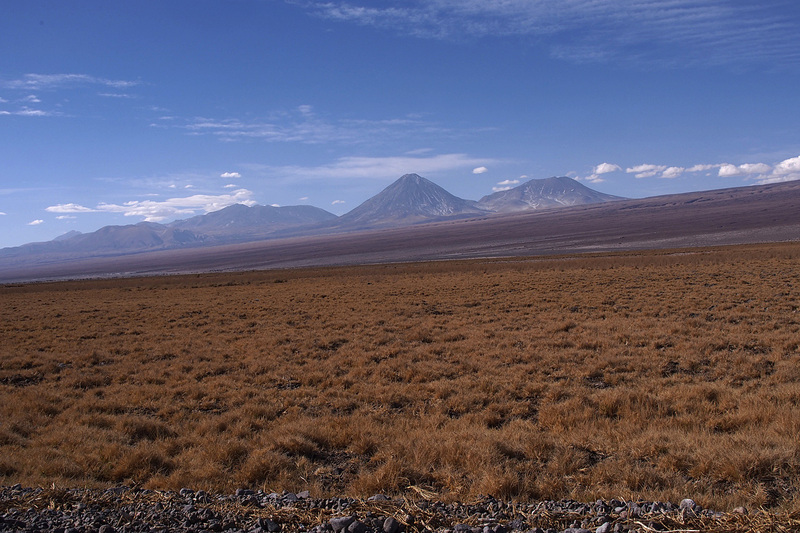 The dry, brown landscape is completely void of any vegetation as the road stretches east into the Atacama to the Cordillera Domeyko and beyond. The road is not paved but is sealed and in good condition, despite the heavy trucks that supply the copper mines in the area. There were basically three kinds of trucks passing us all day: large dump trucks, tankers hauling sulfuric acid and small pick-ups. The road stretched before us with the cordillera creeping ever closer. After a long, hot day in the sun and a steep climb ahead we decided to look for a place to spend the night. An excavation about 100 metres off the road presented some shelter from the wind and offered to hide us from any passing traffic. We called it a day and made camp just as the sun set. To our surprise, we found some ice in a corner of the large pit where the sun had been unable to melt it. It must have snowed recently, pointing to the elevation of our camp site: 2,100 metres. The end of a long, hot day. We did not linger long after dinner as the temperature dropped and we fled for the relative warmth and comfort of the tent and sleeping bags. The nights are long as there is about a 50-50 split between day and night. No matter, we can use the sleep. The morning was cold but we did not think it had dropped below zero as none of our water had frozen. The sun quickly warmed us over breakfast and by the time we were ready to head out on the road we were in shorts and T-shirts again, having packed away the down jackets and wool socks. Our camp in the pit. Our day began with the steep climb we had seen coming the previous day. We climbed the five percent grade for 10 km before the road levelled off at around 2,500 metres. Patches of snow were now visible on some of the south-facing mountains as we rode along this plateau to the final climb into the Cordillera Domeyko. Slowly climbing to the pass. Another 500 metres higher and 55 km from where we had started our day we gained the pass and had one of those WOW! 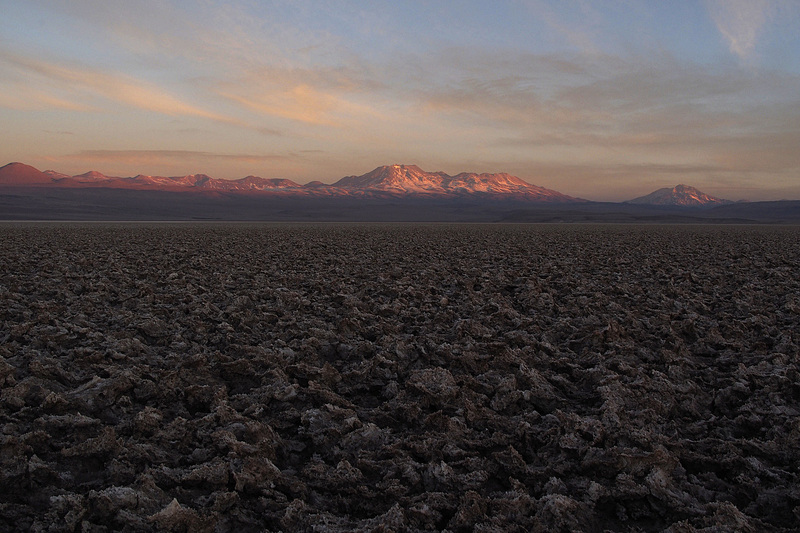 moments as the Andes appeared on the eastern horizon. An even greater WOW! 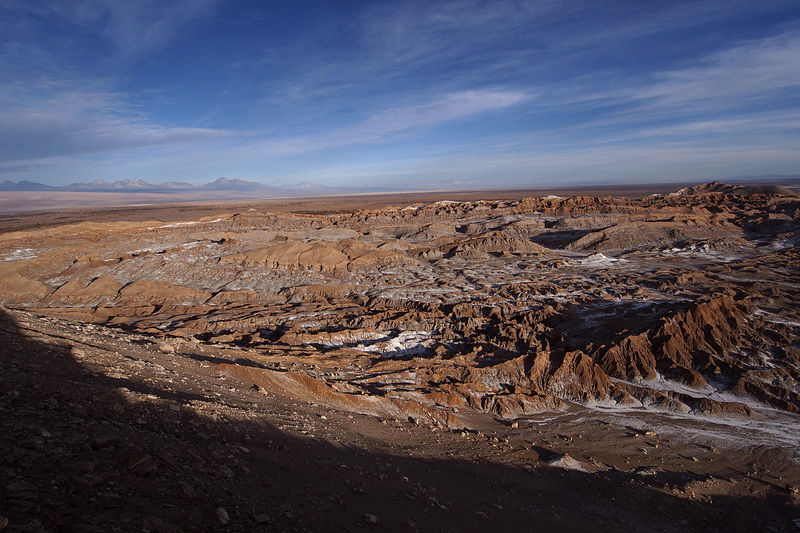 moment happened shortly after while descending the pass as the Salar de Atacama came into view. 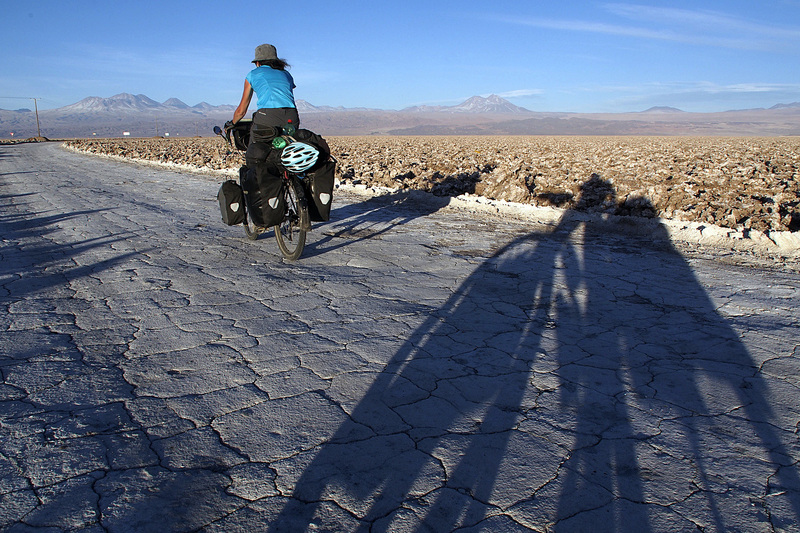 The 15-kilometre-long descent dropped us 600 meters onto the Salar and the next 50 kilometres were almost completely flat. With a stiff tail wind we flew across the Salar at an average speed of about 25 kph. The sun set as we approached the village of Peine painting the volcanos and sky on our horizon in amazing oranges and purples. It was one of the most stunning scenes we have seen. 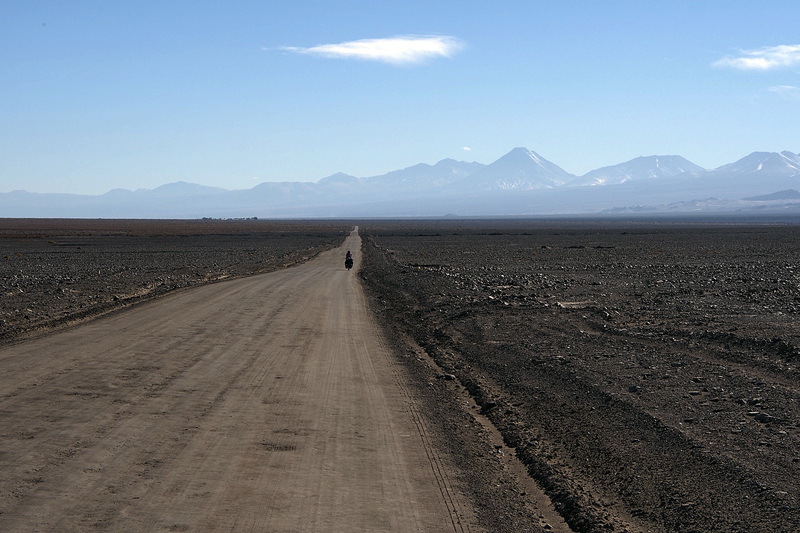 The road looks like it goes down but it’s perfectly flat across the Salar De Atacama. Cruising the salt as the sun goes down. 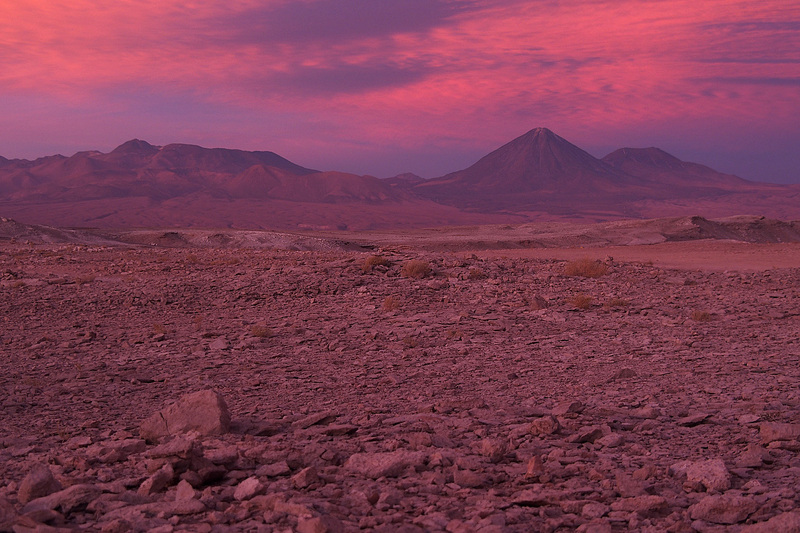 Sunset on the Salar De Atacama. 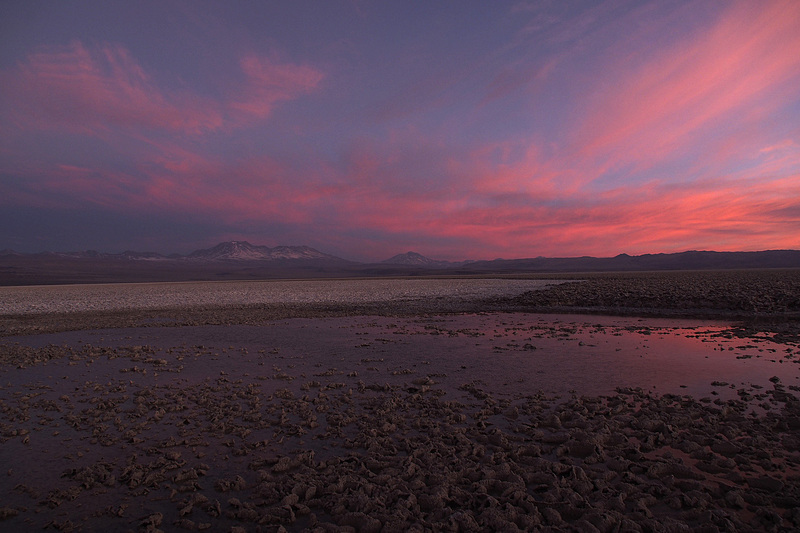 Sunset reflected in a pool on the Salar De Atacama. In Peine we slowly climbed the steep main street of the town finding a small market that was open. We enquired about a hospedaje and the woman made a couple of phone calls providing us with two options: one just a 100 metres up the street and the other at the very end up the steep road. After 120 km and a long, hot day on the road, we did not have much energy left. At the first hospedaje we had one look at the room and took it, including dinner and breakfast. 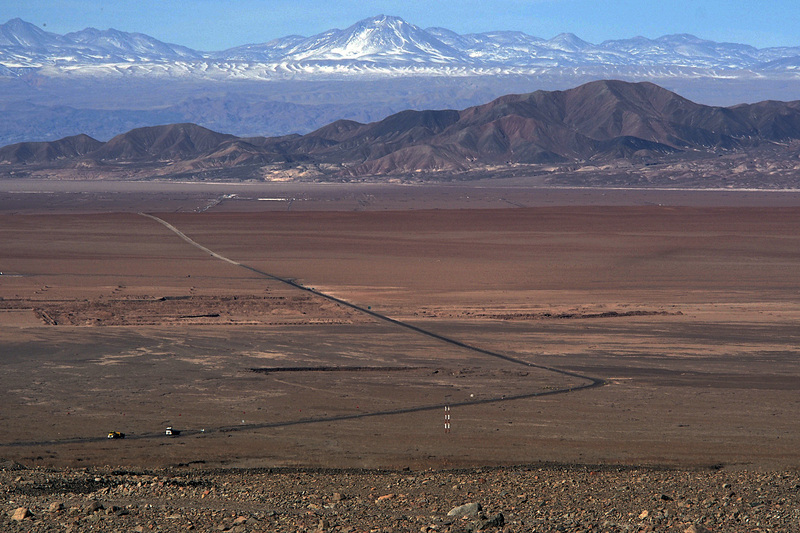 Volcanos along the road north to San Pedro De Atacama. 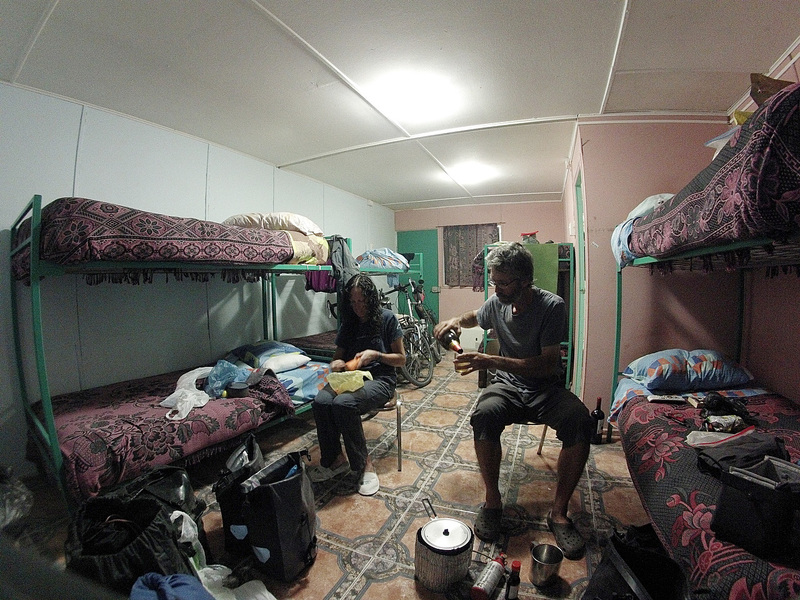 Our host, a lovely woman, presented us with dinner immediately after dumping our gear in the room. We had soup as a starter followed with spaghetti and a slab of beef with tomato sauce. We inhaled it, along with the litre of peach juice she had put on the table. We were quite dehydrated despite drinking a fair bit of water throughout the day. After thanking our host we retreated to our room, had a hot shower and collapsed into bed. 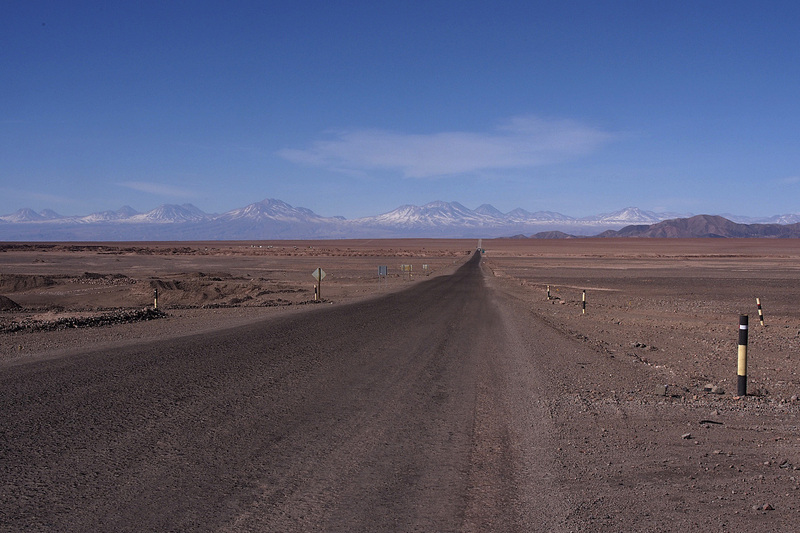 The road north from Peine to San Pedro De Atacama. Refreshed after about 10 hours of sleep and filled up with a nice breakfast we were ready to tackle the final stretch along the Salar to San Pedro De Atacama, 100 km north and close to the Bolivian border. 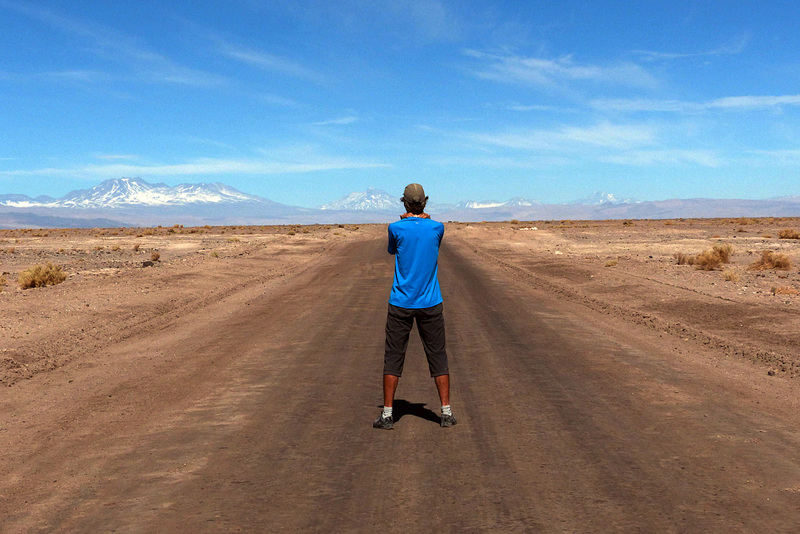 There was no traffic and no wind as we headed north with a string of volcanos up to 6,000 metres to our right and the flat-as-a-pancake Salar De Atacama to our left. 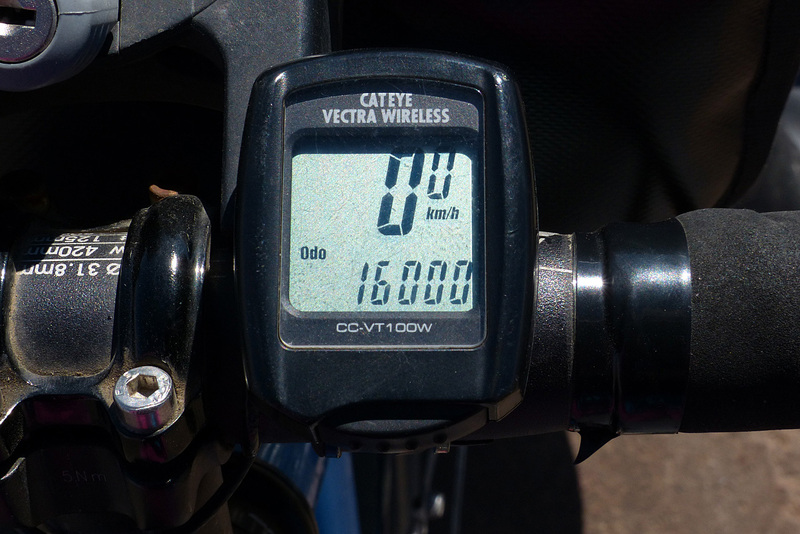 We crossed another milestone: 16,000 km on the road. It was great cycling through this jaw-dropping scenery and a bit like being on another planet. I’ve only ever felt like that in parts of Iceland and on Ellesmere Island in the far north of Canada. Volcan Licancabur looming on the horizon. We stopped for lunch in Toconao where some shade in the playground provided relief from the relentless sunshine. As we continued, Volcan Licancabur appeared. It’s an almost perfectly symmetrical stratovolcano on the border between Chile and Bolivia and a landmark for us as the road out of Chile will go around the base of it and take us higher yet onto the Bolivian Altiplano. 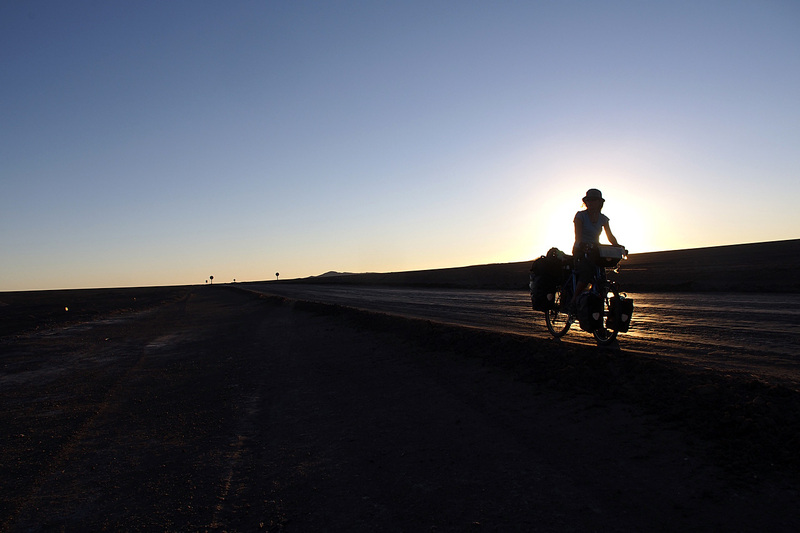 The last 20 km were slow as a stiff northwest wind blew in our face and we had to push hard to reach San Pedro where we were reunited with Cyril, a French cyclist we have cycled with off and on since Patagonia. The last time was when we crossed from Argentina to Chile over Cristo Redentor Pass in early May. 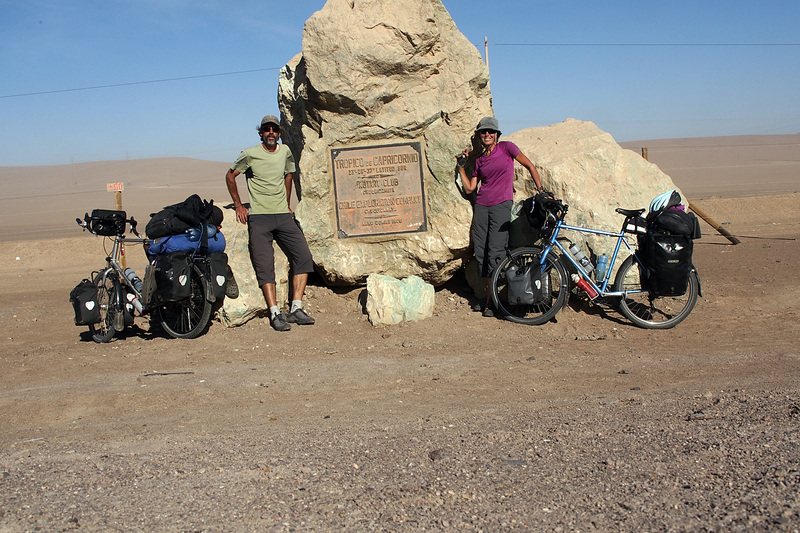 While Cyril cycled north through Argentina, and we through Chile, we had stayed in touch via email and planned to cross into Bolivia together. We have been in San Pedro for a few days helping our bodies acclimatize to the altitude as in the days to come we will climb up to nearly 5,000 metres. There are a bunch of other cyclists here, one of whom, Marcin from Poland, we also met a couple of months ago in Patagonia. 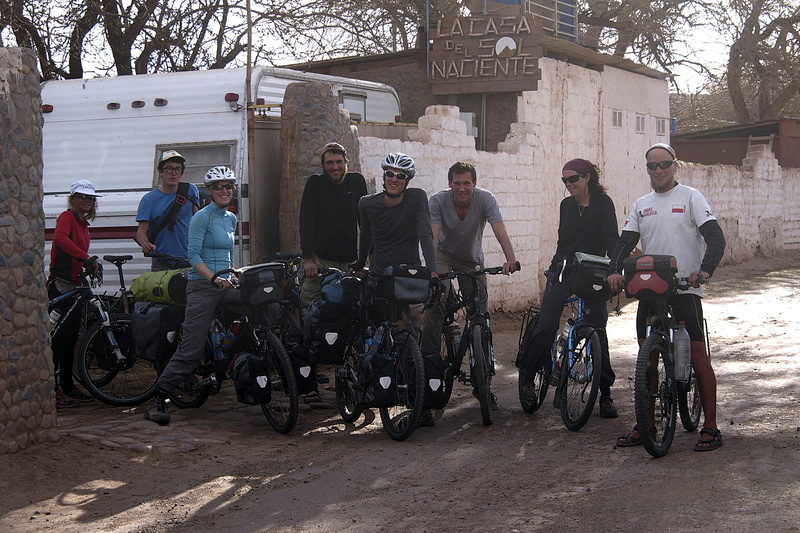 There are several other French cyclists and a couple from Switzerland, and all of us are heading into Bolivia in the coming days. Cycling nomads heading out for a sunset ride. 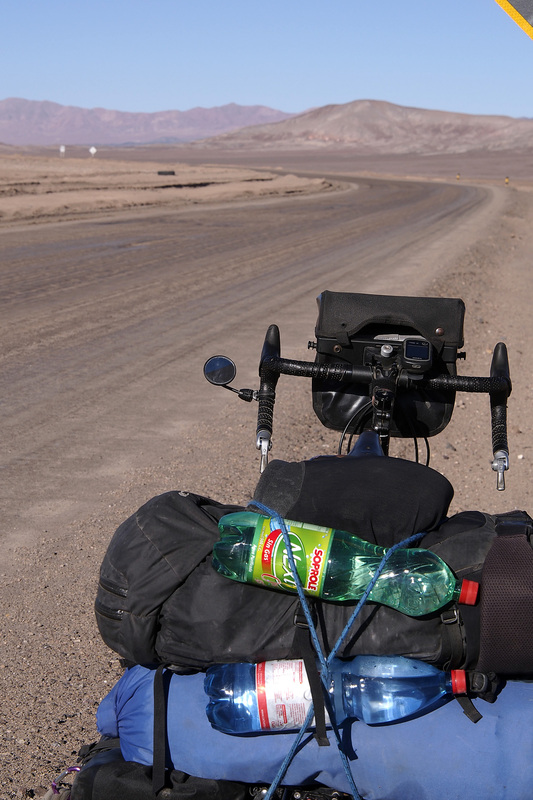 Everybody has been busy tuning their bicycles and stocking up on essentials as there will be little available in southwest Bolivia in the coming days. 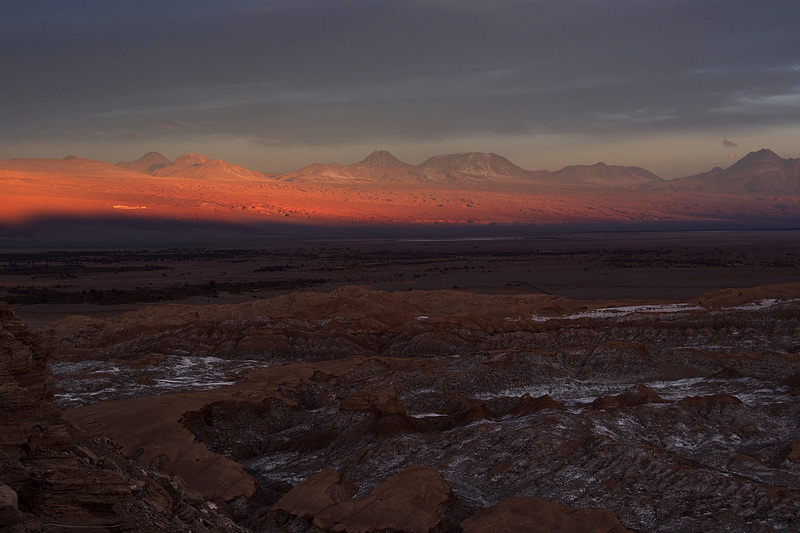 The whole bunch of us set off one late afternoon for a short ride to a viewpoint above Valle De La Luna where we watched the sun set over this amazing landscape around San Pedro. We will never get tired of these spectacles. Valle de la Luna sunset. We’ve spent four months in Chile and Argentina. It has been fantastic. Stay tuned as the next chapter of our journey unfolds. Thank you for reading. 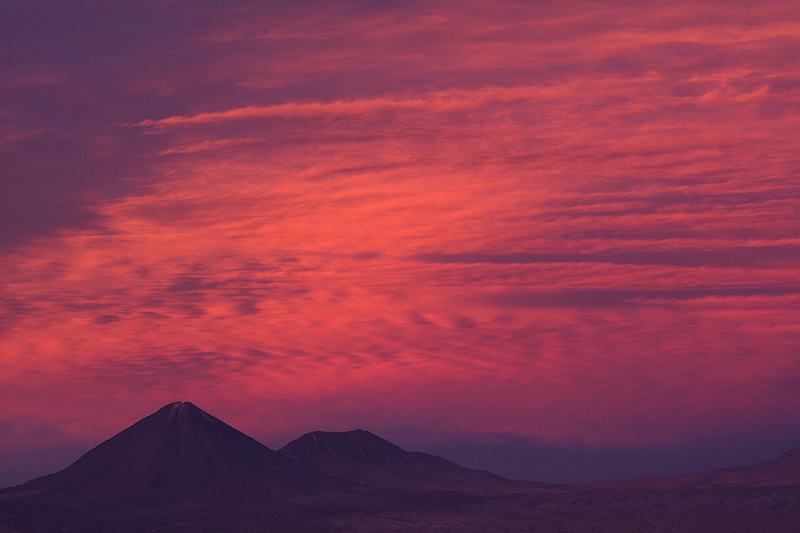 Fire in the sky above Licancabur. 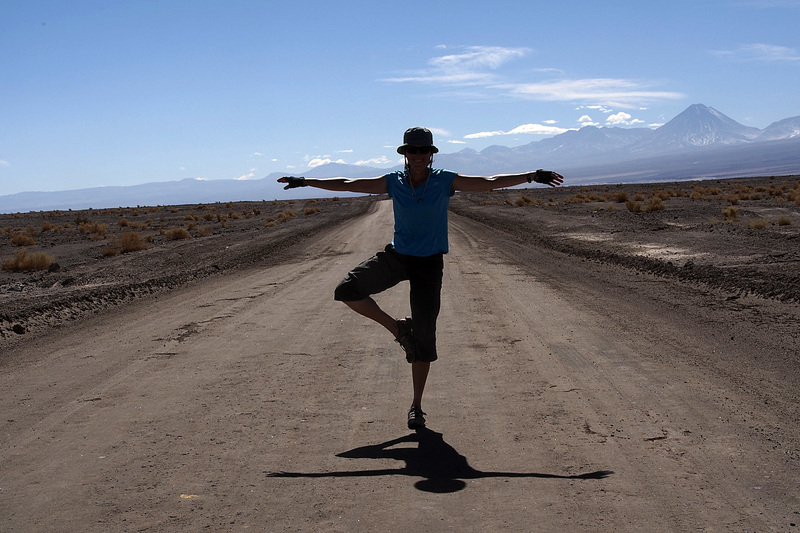 Our road to Bolivia runs between the two peaks. Such amazing colours in the sky. There is beauty everywhere, even in places that otherwise look like the moon. That juice sure must have tasted good. Amazing photos! A remarkable adventure. I enjoy your posts. Stay safe. Incredible pictures, it looks like another planet indeed. People in Whistler are now reading your adventures an masse. 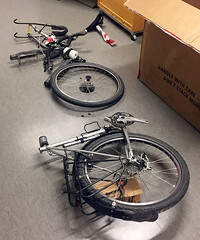 They can’t believe you cycle all day and produce these blogs- when do they rest?, they ask. You guys have become a household item….. way to ride, Jimmy. PS : We got to know of your travels through Paul’s Mom&Dad (Anneke & Adrian ), we got to know them when we lived for a while in PG. Keep up the good life ! Stunning photos. Incredible that the two of you have pedaled 16,000 kilometres in a year. Looking forward to your next chapter.